Martyr, patron of England, suffered at or near Lydda, also known as Diospolis, in Palestine, probably before the time of Constantine. According to the very careful investigation of the whole question recently instituted by Father Delehaye, the Bollandist, in the light of modern sources of information, the above statement sums up all that can safely be affirmed about St. George, despite his early cultus and pre-eminent renown both in East and West (see Delehaye, "Saints Militaires", 1909, pp. 45-76). Earlier studies of the subject have generally been based upon an attempt to determine which of the various sets of legendary "Acts" was most likely to preserve traces of a primitive and authentic record. Delehaye rightly points out that the earliest narrative known to us, even though fragments of it may be read in a palimpsest of the fifth century, is full beyond belief of extravagances and of quite incredible marvels. Three times is George put to death—chopped into small pieces, buried deep in the earth and consumed by fire—but each time he is resuscitated by the power of God. Besides this we have dead men brought to life to be baptized, wholesale conversions, including that of "the Empress Alexandra", armies and idols destroyed instantaneously, beams of timber suddenly bursting into leaf, and finally milk flowing instead of blood from the martyr's severed head. There is, it is true, a mitigated form of the story, which the older Bollandists have in a measure taken under their protection (see Act. SS., 23 Ap., no. 159). But even this abounds both in marvels and in historical contradictions, while modern critics, like Amelineau and Delehaye, though approaching the question from very different standpoints, are agreed in thinking that this mitigated version has been derived from the more extravagant by a process of elimination and rationalization, not vice versa. Remembering the unscrupulous freedom with which any wild story, even when pagan in origin, was appropriated by the early hagiographers to the honour of a popular saint (see, for example, the case of St. Procopius as detailed in Delehaye, "Legends", ch. v) we are fairly safe in assuming that the Acts of St. George, though ancient in date and preserved to us (with endless variations) in many different languages, afford absolutely no indication at all for arriving at the saint's authentic history. This, however, by no means implies that the martyr St. George never existed. An ancient cultus, going back to a very early epoch and connected with a definite locality, in itself constitutes a strong historical argument. Such we have in the case of St. George. The narratives of the early pilgrims, Theodosius, Antoninus, and Arculphus, from the sixth to the eighth century, all speak of Lydda or Diospolis as the seat of the veneration of St. George, and as the resting-place of his remains (Geyer, "Itinera Hierosol. ", 139, 176, 288). The early date of the dedications to the saint is attested by existing inscriptions of ruined churches in Syria, Mesopotamia, and Egypt, and the church of St. George at Thessalonica is also considered by some authorities to belong to the fourth century. 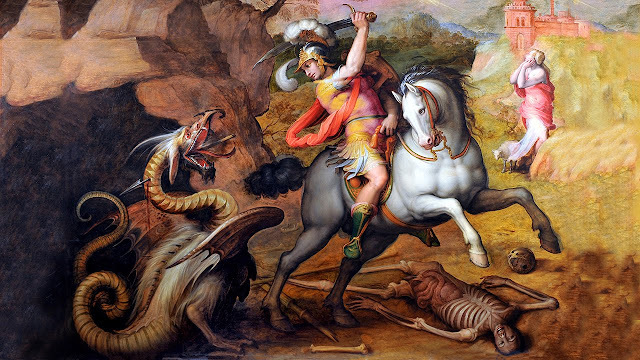 Further the famous decree "De Libris recipiendis", attributed to Pope Gelasius in 495, attests that certain apocryphal Acts of St. George were already in existence, but includes him among those saints "whose names are justly reverenced among men, but whose actions are only known to God". The dear remembrance of his dying Lord, For whose sweet sake that glorious badge we wore And dead (as living) ever he adored.